Is your child a water baby at heart? Do they like toys that can go from land to water seamlessly? If you are still looking for the perfect gift for a child on your gift list, then a toy from the Little Live Pets™ Turtles collection would be an excellent choice! Watch as Little Live Pets™ Turtles crawl on land and into the water, then splash and play once in the water! Each of the turtles in this line of toys is unique with fun shell designs that show off their personalities. This toy is recommended for kids ages 5+. My family received the Little Live Pets™ Turtle Tank to review. Starry, our new Little Live Pets™ Lil’ Turtle, was a favorite with my kids as soon as I introduced him to them. They could hardly wait to get him to get out of the box to play with him. Once out of the box, my kids watch Starry as he crawled about our home. He was really cute, and they really liked the whimsical design on his back that give him his name. We also loved seeing Starry crawling around his tank. There is a mound of land inside of the tank so we could see Starry climb and slide in his home. We than half-filled our pet’s home with water to see our turtle friend make an easy land-water transition. Starry quick crawled into the water and started swimming around. We really liked watching and caring for Starry. It is also great to have a place to keep our pet when we are not playing with him. His tank is a great place to keep him separate from our other toys, and we can put it in so many different places in our home. It is such a great convenience. Starry is a fantastic Little Live Pets™ Lil’ Turtle. He can crawl on land and then slip seamlessly into water to swim around to our family’s delight. The Turtle Tank was great because no work had opt be done to create our turtle’s home, all that was needed was water to have Starry splash and move around in it, and it is great to store our pet once playtime ended. 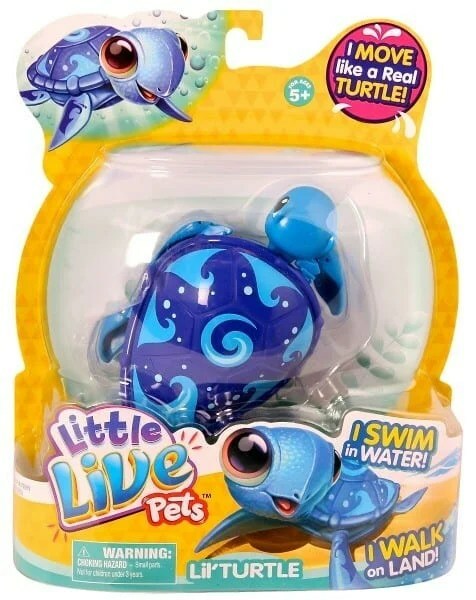 A Little Live Pets™ Lil’ Turtle would make a fabulous gift for any child! To find out more information about Little Live Pets™, you can visit them on their website or on their Facebook page! 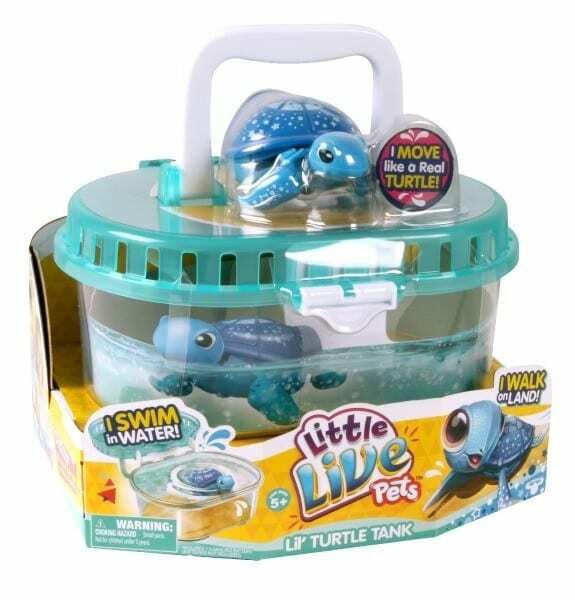 Disclaimer: I received the Little Live Pets™ Turtle Tank in order to write this review. The views expressed are my own. A Little Live Pets™ Lil’ Turtle Giveaway! Little Live Pets™ would like for one lucky Ottawa Mommy Club reader to have a great gift to give this holiday season by giving away one the Little Live Pets™ Lil’ Turtle Single Pack! My daughter would love the little mouse because it’s too cute! This would be a good idea for a pet “test run” for my daughter. My kids love to play in the bath and this turtle would be so fun! My 4 years old loves everything that moves! He would have a blast seeing a little turtle crawl and splash around! My girls would love this because they love animals and enjoy toys they can interact with! My niece would love this because she loves anything to do with animals and these are on her Christmas list. She’s been wanting a pet so this would be the perfect solution. No mess. No fuss. She loves turtles and would love this set to keep in her room. My little cousins are huge animal lovers and this toy is adorable! My daughter loves turtles and begs for a pet every day. This would be so fun for her! My daughter would love it because she loves animals. My children would love to win this because they currently do not have a pet, and this would be great for them to role play pet care with! Plus it is just so cute!! My gal loves her animals! And is always bugging me for a pet of her own. She’d go nuts over this! My kids have been asking me for a pet so this would be good great! My son loves his pets! All 5 of them! Since we have reached our limit this would be great for him to experience having more but without all the work fo Mommy! I think my granddaughter would have lots of fun with this little guy. My daughter is an animal lover and would love to have one to look after and learn the responsibility of having a pet. My grandson would love this to play with in Grandmas tub. My son would be in love with this-totally animal obsessed! My kids would love the turtle – they need a new bath toy, something exciting!! My kids would love the turtle – they keep asking for a new pet! The mouse is so cute and they aren’t getting a real mouse!! I know a couple of kids who would like both the turtle and the mouse. it’s very cute! These are so cute, my son would love to play with it. My daughter wants a pet so badly! My kids would love this because they don’t have any small pets like this and I think they’d love to pretend they did. My daughter is crazy about pets…any kind. This would be perfect for her. My kids have been asking for a pet, so I think they would have a blast with a Little Live pet. My nephew would enjoy watching the Little Live Pets™ Lil’ Turtle move around. My son would love a turtle. My nephew is so fond of turtles and I think he would be thrilled with this. She has fish and a cat, has been asking for a turtle. I think this would do lol. My daughter would love to receive Little Live Pets Lil Mouse as a gift. She loves to nurture and role play and it’s perfect practice for taking care of a real pet. My son would love to receive a Little Live Pet as he loves having animals close by and would love to care for his own pet! My son loves animals and would love to have 1 of his own!! My girls love animals and would love this. My daughters would both love this. I love turtles. They are so cute!! This reminds me of as turtle I had when I was small. My daughter says she would like the turtle because it is cute.